If you don't have a pocket hole jig, I highly recommend picking one up. 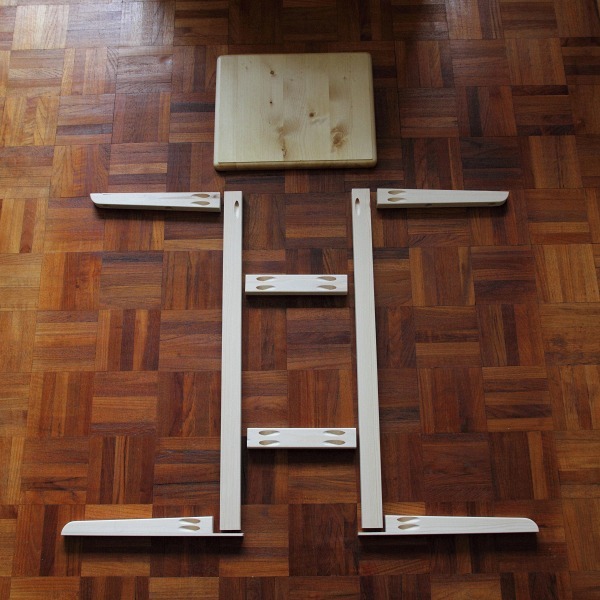 It's a really quick and simple method of joinery, and is tremendously useful for all sorts of woodworking projects. The Kreg Mini jig is inexpensive and is ideal for this project (buy it from Amazon.com or Amazon.co.uk). You'll also need a pack of 1¼" coarse-thread Kreg pocket hole screws (buy from Amazon.com or Amazon.co.uk). The Kreg screws have square-drive (Robertson) heads, so if you don't have any Robertson screwdrivers, the appropriate screwdriver bits are also available on Amazon.com or Amazon.co.uk. Here are the parts ready for assembly. 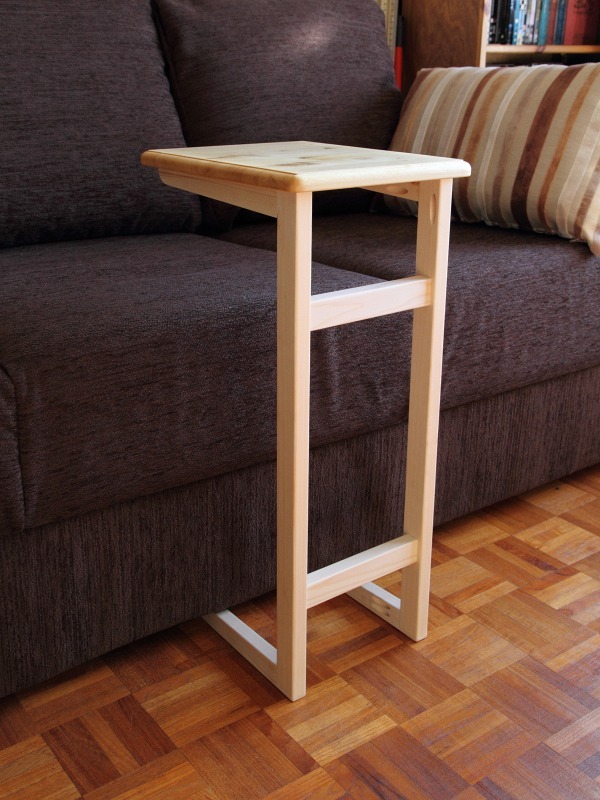 The top is a piece of edge-laminated pine board 260x320mm (about 12½" x 10¼"), with the grain running parallel to the short side. 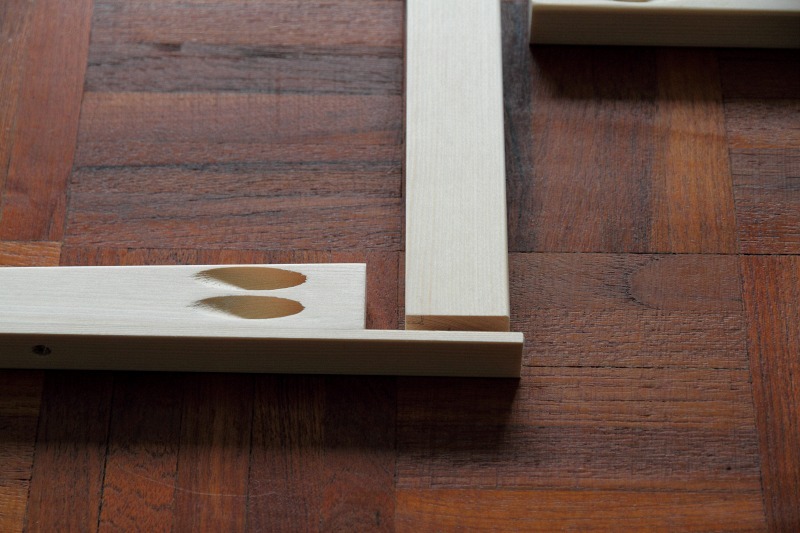 The frame is made from 1"x1½" planed square edged spruce with a finished cross section of 21x34mm. If I were doing this again I would use 1"x2" stock (finished width about 45mm) for extra rigidity. The 1x1½ is quite strong enough, but is a little more flexible than I would like. You want nice straight-grained stock. The feet and top rails are 250mm long (9¾"), and the legs are 610mm long (24"), which gave the right height to fit over the arm of my couch. All these parts come out of one 2.4m (8') length of timber. The two cross-braces (185mm, 7¼") won't quite come out of the 2.4m length, but their dimensions don't need to match the rest so any old off-cuts could be used. A word of caution about assembling the rail-to-leg joints: you're driving the pocket screws in very close to the end of the leg, so care is needed to avoid splitting. Clamp the joint firmly across the faces, and try to align the grain of the leg so that the path of the screw runs across the grain rather than along it. This is the detail of the bottom joint. 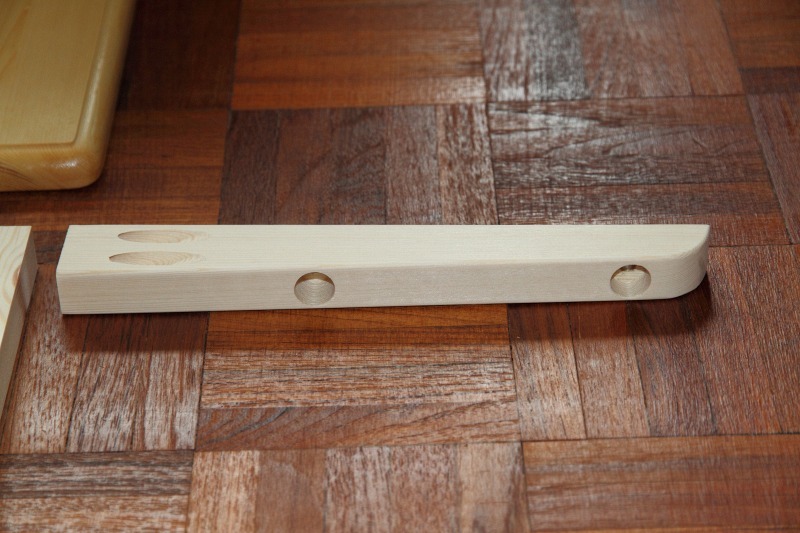 The foot has a thin strip added to help counter tensile forces on the pocket screws. It will be glued and reinforced with a screw driven up into the bottom of the leg. I'll trim it to length after assembly. This picture shows how the top is attached. There are 3 screws on each side. The first is a pocket hole screw going up through the top of the leg (just out of shot). Then there are two holes in the top rail, which are drilled oversize and counter-bored to take a pan head screw with a washer, to allow for cross-grain movement of the top.